This theme could wake the boys up to the fact that growing up can be fun for life. Let them pick a job they may be interested in and let them do their requirements based on it to keep their attention. Not only will they see what there is in front of them, but it will give them a real taste of what they can do. They will also see that they have the ability to do something to benefit themselves, their family, and even the world around them. Just like the ripple affect of a pebble dropped into a pond. One thing that you can do is host a mini career fair. Try to get adults that vary in their job descriptions to talk to the boys and maybe set something up to challenge the boys to see if they can do something that deals with the jobs. Make sure it is something simple enough for anyone to do to start out with. For those who need something more challenging you can set up more than one activity at a time. If you are having problems see if you can get a hold of the zoo, planetarium, a museum, or even universities. Talk to the departments that the boys are interested in and you might be able to find someone who will be kind enough to make time to come talk to your pack. (Or let the boys learn about the jobs by putting on the job fair themselves where they set up a display to show what they learned about the job. It could be posters, games, or they could just talk about what they learned. Let them have fun while showing what they learned.) You can even make a backyard gym decorated to fit the theme of the job(s). The Utah Museum of Natural History has kits that you can sign up to borrow that deal with DNA extraction and ancient ecosystems. You now have a chance to experience what it is like to extract DNA and being a paleontologist. That’s just the start of the types of kits. How about dealing with plants? You got it. They have one for that too. They are going to place the list of kits on www.umnh.utah.edu/BoyScouts . You can get a hold of them at (801) 581-4303 to set up field trips too. Lots of things can be done on these trips or the kits. Librarians and teachers are good for finding activities to do. Look at the Cub Scout Academics and Sports programs. Most jobs need education and/or physical fitness. There are many things that you can pass off. This would be a great time for planning a space derby. Let your imagination go, and remember to let the boys use theirs too. Adapt for disabilities in all things! Props showing items related to different careers. 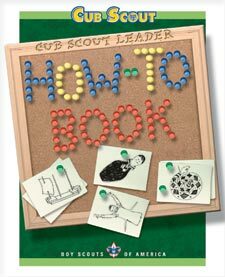 Have a pack career day where Cub Scouts introduce their parents who then talk a little bit about what they do in their job. Invite individuals from the community to come and share information at a den or pack meeting regarding their career. If you have a Space Derby, be sure and check out the NASA web site. If you live close to a NASA facility, you might be able to have a special van visit your pack meeting – they even have a step-in space suit! If you go to a Space or Science Museum website, check out online resources for kids and teachers, videos, games and activities - some will even send you a packet of activities! Have your own Tortilla In Space contest – boys invent a “Space” treat using various food items – but a tortilla must be a main ingredient. Go to the Space Place website to see some ideas – and try the Tortilla rocket under Cub Grub. Things To Use For Embellishments. Use the puppets to complete a skit, pass off requirements and achievements, discuss this month’s theme, or take home to share with family. Use fabric or felt for clothing. Use yarn for hair. Draw a face on the spoon with markers. Try different sides of the spoon for different looks. Materials - Lunch bag size paper bags. Have pages with printed animal or people patterns available or ideas for the boys to draw. Remind them that part of the puppet can be put on the underside – below the flap. Decorate the rest of the bag. 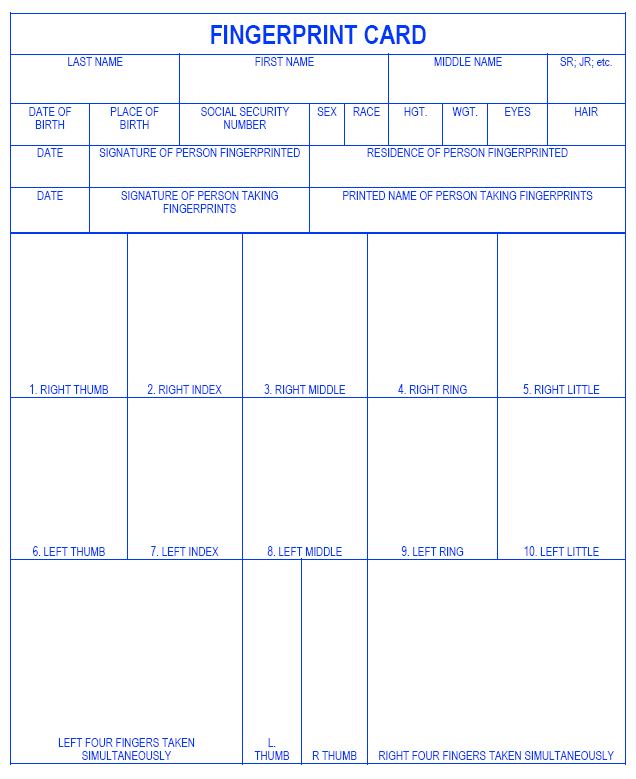 Materials - This template is a guide. Enlarge if needed. The head and body part should be about the width of the finger. Have the boys draw different characters from a book, movie, or play. They can also write their own story to tell with the puppets. After the drawing is done wrap the puppet around their finger and tape the 2 tabs to fit. Another way to make hand/finger puppets is to use a glove with fabric and felt. Create the character and then glue it to one of the fingers of the glove. Create animals and creatures using different size pom poms. Glue on googly eyes. Add pipe cleaners for antenna, arms or legs. Attach puppet to a tongue depressor stick, or glue a string or cut rubber band to make it a marionette style puppet. Draw or cut out pictures for the puppets. Laminate or cover with clear packing tape to make puppet more durable. Attach the picture to a tongue depressor or similar stick. 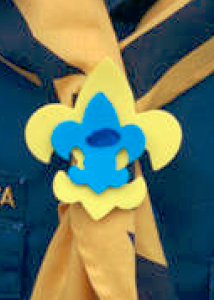 Each Scout should decorate a piece of construction paper approximately 6” x 18”. Ask them to decorate it with what they would like to be when they grow up. Cut the crepe paper into streamers (2’ lengths) and glue them to the back of the construction paper. Roll the construction paper into a tube and staple it closed so that the picture is on the outside and the crepe paper streamers are on the inside of the tube. Knot a 30” piece of string at both ends, and staple it on opposite sides of the tube to make a handle/hanger. 1. Trace fleur shapes onto foam pieces and cut out. 2. Punch two holes in the yellow fleur-de-lis shape. 4. Cut a chenille stem in half lengthwise. 5. Lay the blue shape on top of the yellow shape, matching holes up. 6. Bend the chenille stem in half and insert through the holes. 7. Put on your uniform and scarf. 8. Twist the chenille stem around the back of the ends of the scarf. 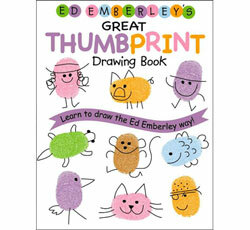 Ed Emberly’s book that started it all! Using tin snips, cut circuit boards into tie slide sized squares or rectangles (1 ½” –3”). Twist ½ a chenille stem into a circle. Duct tape or glue or thread the chenille loop to the back of the circuit board piece. Make a silhouette of each boy before the Pack Meeting. Each boy then makes a collage of pictures showing occupations, clothing, equipment and materials used in his choice of occupations. Mount both the silhouettes and the collages on the wall and let parents guess who is represented, and which collage belongs to which boy. 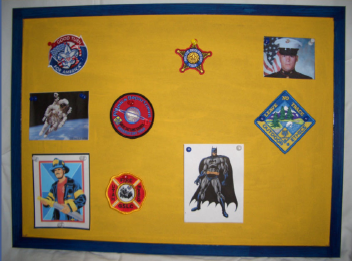 Then add name labels or let each boy talk about his collage and occupation interests during the meeting or when he is called up for awards. At tables around the room, parents staff stations featuring their careers. Den members travel from station to station to learn about the careers of pack family members or guests. Take a Discovery Hike to see what plants are beginning their spring growth this month. Take a bicycle ride in a local park. Consider flying kites as a den activity. Play an outdoor game such as softball or soccer. Materials: Two plastic soda bottles for each boy. Cut the top fourth of each bottle off. A list of personal statistics such as height, weight, hair and eye color, age, favorite school subject, etc. Cut out pictures from favorite books, TV programs, movies, friends, scouting activities, family members – whatever makes each boy unique. You might even have each boy write down something special about every other boy to be added to the capsules. When the capsule is full, slide one open end of the soda bottle into the open end of the other as far as possible and then tape them together with duct tape. With a brush, coat the outside of the soda bottle with white glue diluted slightly with water. Now roll the capsule in wrinkled aluminum foil. Add an identifying name tag with the boy’s name and when it should be opened. It would be fun to do this as a Wolf Den and then open the capsules when they are joining Webelos. One leader also suggested making a Den Time Capsule, with each boy being “interviewed” by the leader. Tell me something funny that happened to you? What do you think you will be doing in 10 years? Do you have a favorite hero? Add pictures of each boy, then seal in an envelope and open them in a year, two years ??? 1. Thumbtack the streamers onto the cork. 2. Make sure cork is right size to fit in the bottle neck and seal the soda bottle. 3. Put 1/2 cup of water and 1/2 cup of vinegar in a quart plastic soda bottle. 4. Put a teaspoon of baking soda on a 4" x 4" piece of paper toweling. Roll up the paper and twist the ends to keep the baking soda inside. 5. Outside, where you’ll have plenty of altitude available, drop the paper into the bottom of the bottle and put on the cork as tightly as you can. The liquid slowly soaks through the paper toweling. The baking soda reacts with the vinegar to produce carbon dioxide gas. As more gas forms, pressure builds up inside the bottle. 6. You can’t have an accurate countdown, so just stand back and wait. Eventually the cork shoots skyward with a loud pop! 7. Outside, where you’ll have plenty of altitude available, drop the paper into the bottom of the bottle and put on the cork as tightly as you can. The liquid slowly soaks through the paper toweling. The baking soda reacts with the vinegar to produce carbon dioxide gas. 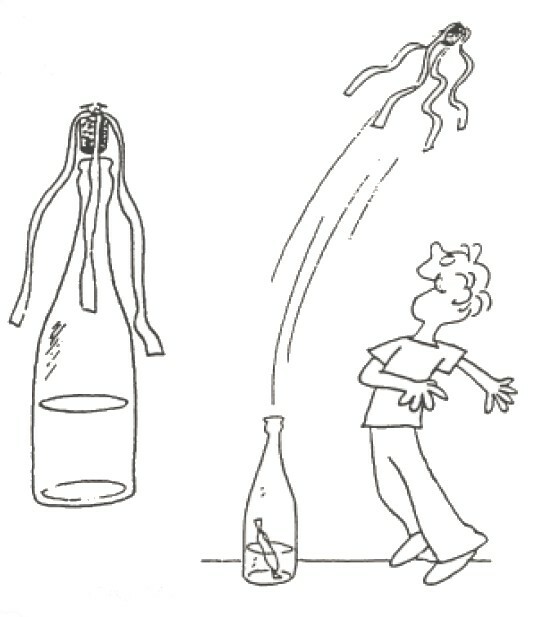 As more gas forms, pressure builds up inside the bottle. 8. You can’t have an accurate countdown, so just stand back and wait. Eventually the cork shoots skyward with a loud pop! These cars will zoom along flat ground for quite a distance. They would be fun cars to race along with the regular pinewood derbies or in place of. 2 Pairs of wheels on axles (from an old toy car) or on a piece of wood (1/2" x 1/2" x 3"). 1. 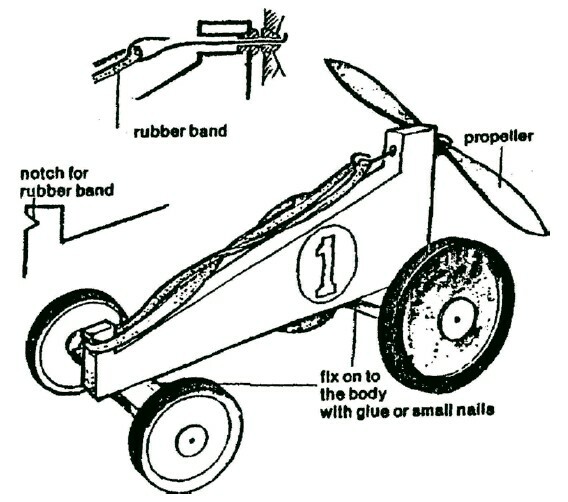 Fasten wheels to body similar to a pinewood derby car, or make wood axles from small piece of wood. Drill holes in ends for nails to hold on wheels. 2. When you fix the axles to the cross pieces, make sure the wheels can turn freely. 3. Be very careful when you drill the small hole for the propeller wire, it need only be about 3/16" (or 95 mm) in diameter. 4. A bit of cooking oil on the rubber band makes it work better. Know how to sharpen a knife. A sharp knife is safer because it is less likely to slip and cut you. 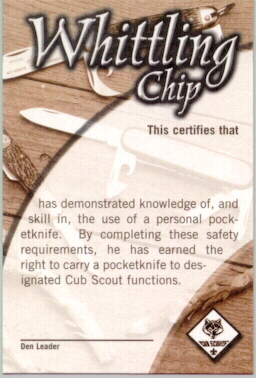 Never carry an open pocketknife. When you are not using your knife, close it and put it away. When you are using the cutting blade, do not try to make big savings or chips. Easy does it. Make a safety circle: Before you pick up your knife to use it, stretch your arm out and turn in a circle. If you can’t touch anyone else, it is safe to use your knife. 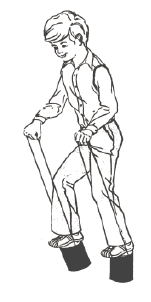 A sealer (spray or brush on). Draw the design on with light pencil then outline in black sharpie and paint. Spray or paint on a sealer coat. If desired, cover the bottom of the rock with felt to keep from scratching surfaces. Use larger rocks and place in outside planters, or as a doorstop. 1. Cut out one end of the can. In the other end punch two holes just large enough for the rope. Tie the ends of the rope together inside the can. 2. Step on the closed end of the can and hold the rope in your hand. As you lift your foot, pull on the rope. 1. Enlarge pattern to approximately 10 3/8" x 6". Cut paddle from 1/4" plywood, using the pattern shown. Sand and Paint, if desired. 2. Cups are plastic pill bottles (or film canisters), approximately 1" diameter. 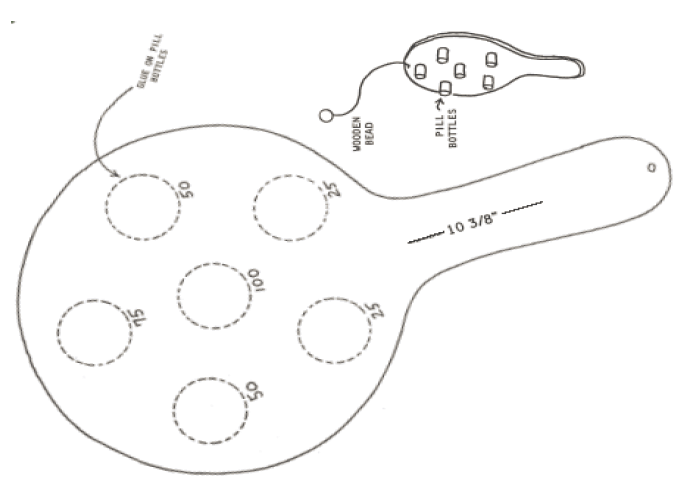 Glue to paddle in places shown. 3. Ball is wooden bead, tied to front of paddle with a string approximately 12" long. 4. Toss balls into cups and add up score. The web site, http://www.animatedknots.com/, offers video clips on how to tie many different knots. Plant a lima bean seed against the side of a clear cup. Place it in a warm place and watch it grow over the next few weeks. What do you want to be when you grow up? 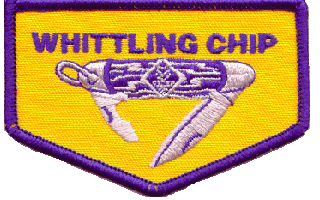 Earn Council Activity and Trail patches from places that you are interested in. Collect patches, pictures and mementos that you want to be in your future! Step #1. Take the bulletin board outside. Step #2. Lay the newspapers out on the grass. Step #3. Lay the bulletin board on the newspapers. Step #4. Using a sweeping motion, lightly cover the bulletin board tops and sides with spray paint. If needed, spray a second coat and let dry. 1. Lay newspaper on table or flat surface. 2. Lay bulletin board on the newspaper. 3. Pour desired color of paint onto paper plate. 4. Paint cork part of bulletin board with one solid color, Paint a second coat if necessary. 5. Rinse brush in water and squeeze out all the water. Squeeze excess water into a paper towel. 6. Paint frame of bulletin board with another color. 7. Paint a second coat if necessary. 8. Allow paint to dry well. 9. (Optional) For a shiny finish on frame, rinse out brush again and apply a coat or two of clear varnish, allowing varnish to dry between coats. P Bear Achievement - Law Enforcement is a Big Job - Have a police officer come to a meeting or go visit them at the station. and -10 (Bear) for more details and ideas. This would be a good month for all levels to work on some of the Academics and Sports belt loops and pins – especially if they reflect occupations that boys are interested in choosing when they “grow up.” If your pack is having a Space Derby, or if you have boys interested in Air & Space as a career, be sure to check out the activities designed by NASA correlated to every level of Cubs and covering specific requirements of Belt Loops or pins. Whenever you see an asterisk (*)in this list, you will find specific Tiger to Webelos ideas at the NASA Space Place website: www.spaceplace.nasa.gov/ scroll down and click on Friends Share. Ach #1D – For your family scrapbook, try to find out what your ancestors did for a living. Do you share any of their talents?